Dontay Pompey (Sales Manager): Have you noticed that when applying for an auto loan, companies tend to require more down payment due to the amount of repos that you have? Well, that’s because repos affect credit. Repos are a big hit to your credit score. It makes it harder to get approved for a vehicle or anything, for that matter. Not to mention, you don’t want to be garnished or paying for a vehicle you don’t drive anymore. Some may think a voluntary repo — meaning giving the vehicle back — has less consequences or is not considered a repot at all. But in all actuality, it is reported as a repossession on your credit. Narrator: Our mission is to help Oklahomans get into their next vehicle. We’ll work to get you in the vehicle you want with payments you can afford. Howard: You’re in a family environment. Nobody pushes you, nobody rushes you, and they give you exactly what you asked for. Karla Banks (Business Development Specialist): Your success is Integrity’s success. We’ll help you structure a loan payment plan that works within your budget. We want to see you be successful in your loan with payments you can afford. Narrator: Beware of dealers who sell you a car using a “spot delivery” agreement. That means they haven’t really gotten you financed yet, and even though you drive away with the vehicle, the dealer can come get it back if they are unable to get you financed. Not a problem at Integrity! We are the bank! When we say you’re approved, you are approved! We follow the Golden Rule, and we will treat you the way you want to be treated. That is the Integrity Family Way! Karla Banks (Business Development Specialist): Here at Integrity Auto Finance, we make it extremely easy and convenient for you to make your payment. We know that it gives you peace of mind to know that you’re current and don’t have to waste gas or time coming in to pay. Most places charge a convenience fee to pay with a debit card, but here at Integrity, we pay you with AutoDollar Rewards. Each time your payment goes through, you’ll receive $5 in AutoPay Rewards that you can use to get oil changes or service to your vehicle, and also a 1% interest rate reduction! And when the time comes for you to trade in your vehicle, and you’re currently on AutoPay, it will help you get lower payments and bigger discounts. Narrator: Making your payment on a car loan is a great way to help you establish or rebuild your credit. Integrity reports to all three credit bureaus, providing the best credit reporting coverage we can give you. You’re not going to find that at most other Buy Here Pay Here dealers. Integrity is committed to your success. Jeremy: I was looking to purchase a home, and I went in to talk to a banker. And that guy, he looked me straight in the eye and said, “Sir, you don’t even qualify to talk with me.” I said, you know, it’s time to get us on the right track. We’ve got to start doing something — we can’t be paying $1,100 a month in rent for the rest of our lives. I saw this Avalanche up on the rack and I said that’s what I want! So far it’s worked out perfect — within six months I’ve gained 140 points on my credit score and now I have my eyes out shopping for our home to raise our family and grow old in. Narrator: At Integrity Auto Finance, it is our mission to help you build better credit. 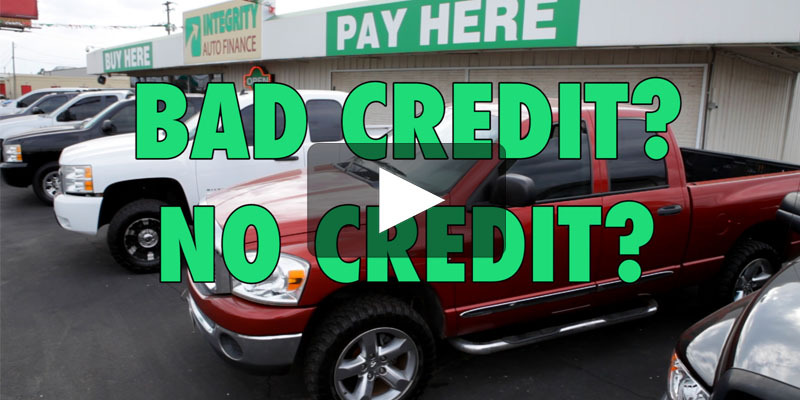 Every week, we actually lose customers who have successfully rebuilt their credit and moved on to qualify for conventional financing at new car stores. Matthew Tinsley (Dealers Finance – Finance Manager): Hi, I’m Matthew Tinsley, the finance manager here at Dealers Finance. We’re here to provide top-of-the-line customer service. We have over 40 years of finance experience combined. Our qualified team is here to answer all your finance questions, so we like to have the best communication possible with our customers. We’re here to build credit, establish genuine relationships, as well as meet all of your finance needs. From questions about your auto loan to setting up an oil change, our staff is here for you. Call today and ask about our Referral Program, so we can figure out a way to get money back in your pocket. Give us a call today at (405) 456-6300. Thank you!